W x D x H: 475 x 540 x 415mm. Reaching the top shelf in a cupboard or other high up areas can be a challenge, so some sort of steps will be required to assist in individuals achieving this easily, preventing them from over stretching and gaining an injury. These plastic safety steps from Slingsby are lightweight and are moulded from medium density polyethylene. Fitted with slip resistant abrasive strips to aid safety and being waterproof and chemical resistant they are ideal in many workplaces. Although these steps are light weight they are also heavy duty with a 260kg capacity and they comply with EN14183 2003E. 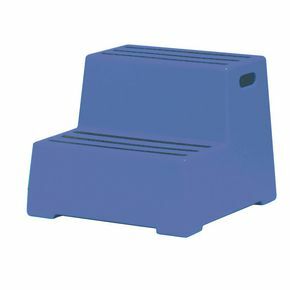 The plastic safety steps are available in three colours; blue, red or yellow and they have two steps. Our plastic safety steps are an ideal addition to a workplace that requires convenient and robust steps to help employees access hard to reach areas. They come with a 12 month guarantee and FREE UK Delivery.